This is a custom order for a customer wanting to frame a block print. It is one of my most popular frames that is called a Simple Mission Tenon Frame #2030. 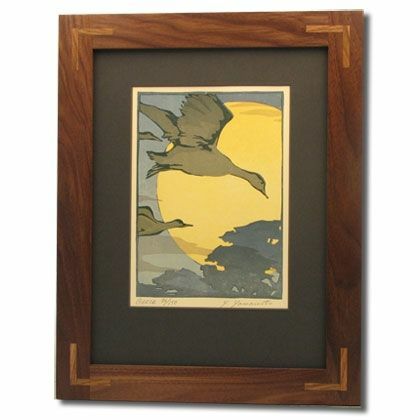 This particular frame is constructed from Black Walnut using mortise and tenon joinery. The customer then wanted inlays using oak in each corner to contrast against the black walnut. The rails and stiles are 2" wide. Other woods that can be used for this frame are cherry, quarter sawn oak, mahogany, or many other available woods. Ordered 3 more frames and we are extremely happy with them, gorgeous mission style! This frame is really gorgeous! It worth every penny and for sure, will add value to any picture/painting you use with it. Ordering a second one! Thanks!